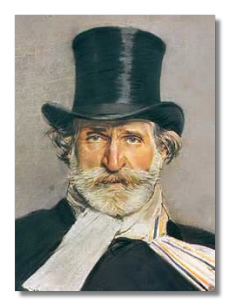 Giuseppe Fortunino Francesco Verdi (October 10, 1813 - January 27, 1901) was born in Roncole in the former duchy of Parma, he first studied music in the neighboring town of Busseto. Then, upon being rejected in 1832, because of his age, by the Milan Conservatory, he became a pupil of the Milanese composer Vincenzo Lavigna. He returned to Busseto in 1833 as conductor of the Philharmonic Society.